Americanism means the virtues of courage, honor, justice, truth, sincerity, and hardihood; the virtues that made America. The things that will destroy America are prosperity-at-any-price, peace-at-any-price, safety-first instead of duty-first, the love of soft living and the get-rich-quick theory of life. NR NARAYANA MURTHY OF INFOSYS delivered the opening lecture at Columbia Business School's Khemka Distinguished Speaker Forum at Manhattan on May 26, 2009, where the above quote from Roosevelt were the closing lines. Mr. Murthy began by describing Capitalism as an economic system in which investment in and ownership of the means of production, distribution and exchange of wealth is made possible and is maintained chiefly by the private individuals or corporations. It is a system that incentivises individuals to use their enterprise, drive, hard-work and innovation to create wealth for themselves and the society. Mr. Murthy argued that capitalism is also a system most conducive of creation of jobs and elimination of poverty and no other social or political system has succeeded as much as capitalism in benefiting the society at large. 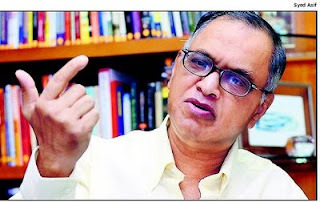 Providing his reactions on the issue of things going wrong with capitalism in recent months - especially the disproportional funds and bonuses claimed by executives of organizations going bankrupt, billions worth of fraud funds, and leaders cooking up accounting books - Mr. Murthy, who was declared by The Economist in 2005 as one of the top 10 most admired global business leaders, called for looking inward and for cultivating better ethical qualities to become a respectable leader. Following are the eight of them as he recounts. 1. Create a good culture around you: Decent behaviour stems from a good culture surrounding a person. It is required to have the culture of openness, fairness, honesty, decency, transparency and accountability in a corporation. This task has to start from day one, and can not wait till you become a CEO. 2. Cultivate simple and inexpensive habits: The best way to overcoming greed is to derive pleasure and spend time on small, simple and inexpensive habits in life. Every decent town has a modest library. And, the government (still) does not tax having a good conversation. 3. Do not equate success with money and power: Success is your acceptance by the circle of you family, friends, your officemates, and your community that you are indeed valuable. Success is also about having good sleep every night. 4. Create an environment of happiness around you: A happy leader has a circle of supportive family and friends. Building such a circle requires a lot of emotional investment on your part. I do not know of anybody who is a demon at his office and an angel at home. 5. Don't get fixated on extreme desires: Desire is the root cause of all sorrows, said the Buddha. Extreme fixation with material things leads to greed, fraud and acts that we would later regret. 6. Shun jealousy: Jealousy is a rationalization of your failure vis-a-vis another's success or achievements. 7. Maintain transparency and develop a sense of humility: When in doubt, disclose (with your family, friends and at workplace). Humility is admitting that there could be other people better than me, and helps cultivate team-spirit. 8. Take part in charitable activities in your spare time: The opportunity of meeting other generous people outside the hierarchy of your organization is a sure way of escaping the orbit of jealousy. Go here for the related article on Columbia website. Go here for more on Mr. Murthy on the official Infosys website.